The Ford family of vehicles has typically delivered power, security, and driving excitement; the vehicles in this model year are likely no exception. We are proud to offer the 2018 Ford Edge and other top-quality vehicles from Petrie Ford. Visit our dealership for a wide selection of cars, trucks, SUVs, and crossovers. 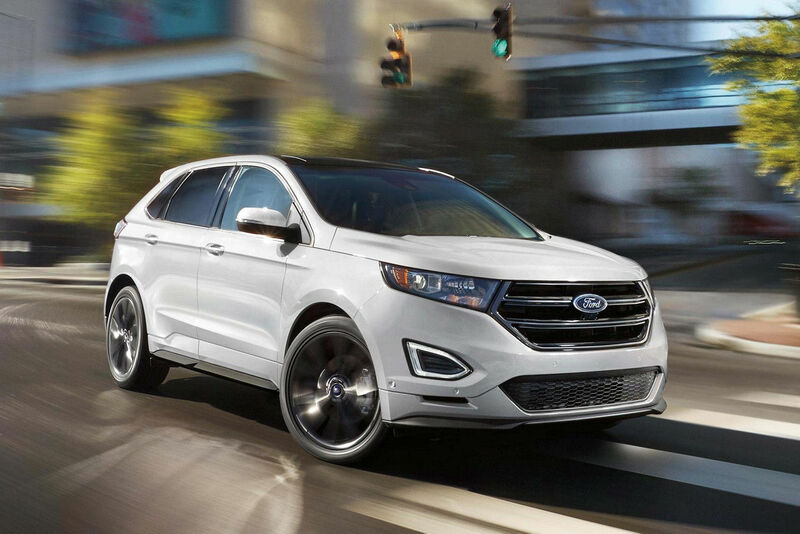 The new Ford Edge has been designed for powerful road performance. With features such as Adaptive Cruise Control, Enhanced Active Park Assist, and the available Lane-Keeping System, this vehicle is generally filled with the technology required to keep you safe on the road. Power is delivered from the turbocharged 2.0 L EcoBoost engine with direct injection. This engine can give you an estimated 20 city/27 highway/23 combined MPG when all-wheel drive is engaged. Surround yourself and your family with the security offered by the new Ford Edge. Generally, this crossover has been built with safety in mind. It includes often important features, including an intelligent all-wheel drive system. This system can integrate sensors that monitor the torque of rear and front wheels, balancing forces to improve handling and traction. This special feature may be available on all Edge vehicles and come standard on the Edge Sport. Advanced technology is often a feature of Ford vehicles, including the new Ford Edge. With available driver-assist features, the Edge can be safer and more dependable than ever. The Ford Smart and Safe Package includes the Blind Spot Information System with cross-traffic alert, adaptive cruise control, and a front 180-degree camera. Enjoy the convenience of features such as auto-dimming driver’s side view mirror and rain-sensing wipers on the windshield. The Ford Edge typically offers something for everyone. It can make a great family or commuter vehicle, with plenty of cargo room for hauling all your gear. Stop in to Petrie Ford today to test drive this or any other fine Ford vehicle.